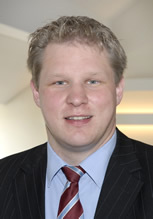 Mr. Quellmann joined the Hamburg office in 2007 as a patent attorney trainee after obtaining a degree in electrical engineering at the Technical University of Hamburg-Harburg and having worked in industry for several years (amongst others in the fields of microprocessor-controlled speed controller for three-phase asynchronous motors, digital audio technology, digital signal processing (DSP) and pulse-width modulation methods). After completing his vocational training and joining the firm's Hamburg office as a fully qualified patent attorney, he became a partner in 2017. Mr. Quellmann is a recognized professional representative before the national and international authorities of intellectual property (GPTO, Patent Appeal Court, WIPO, EUIPO). His work is principally focussed on preparing, defending and enforcing patents as well as advice on intellectual property rights of third parties, licence agreements, co-operation agreements and trademark law. His major technical fields are mechanical engineering, electronics, especially in the field of digital and analogue technology as well as power electronics, measurement and control technology, computer and microprocessor technology, communications engineering and physics.